UberMenu offers a variety of Advanced Menu Items, available in the Appearance > Menus screen. 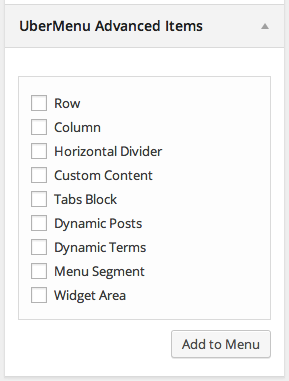 These items help you create more advanced layouts, with elements like Tabs, Rows, Columns, Widgets, Custom Content, and more. You can add these items to your UberMenu just like normal items. Hover over each item to get a quick description of what it does. Note that you can only use UberMenu Advanced Items in UberMenus, not in other types of menus (in other menus, they will just appear as Custom Links that don’t do anything).